Belize, the little Central-American nation, casts a spell—especially on those with a spirit of adventure. Attractions include the warm, English-speaking people, the natural beauty, and the air of freedom and opportunity.For many years, the country has drawn people from all over the world who want to live in the sun while taking advantage of the country's real estate bargains and reasonable cost of living. Add to that the protection of assets and terrific fishing and diving and you can understand why Belize captivates so many.A young country (independent from Great Britain since 1981), Belize has a small population (330,000) and plenty of empty, wide-open spaces. This is picture postcard Caribbean. Four hundred years ago, pirates would lie in wait among the 200 islands scattered off the coast. 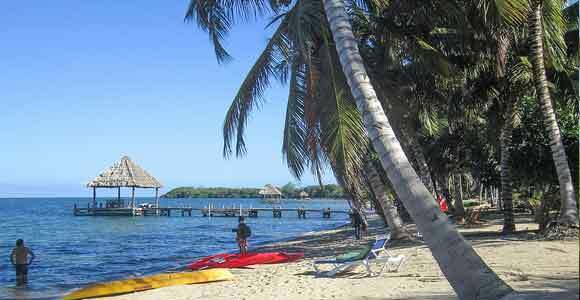 But these days, all you'll find hiding on the cayes and islands are divers, sailors, and anyone looking for an affordable way to enjoy total privacy.To a growing number of expats weary of regimented, rule-laden lives at home, free-wheeling, casual, affordable Belize has proved almost irresistible. Here, you are blissfully free from commuter crush, 24-hour news, and workaday stress. It's a country where you can explore and develop, and there's room to breathe, with a pervasive, heady sense that almost anything goes.See below for videos of Belize. Learn more about Belize and other countries in our daily postcard e-letter.Simply enter your email address below and we'll send you a FREE report - Belize: The Top English-Speaking Retirement Haven in the Caribbean.This special guide covers real estate, retirement and more in Belize and is yours free when you sign up for our postcards below. The Cayo District in western Belize, is known for its winding rivers, honeycomb caves, dense rainforest jungle, colorful birds, elusive jaguars, and rich Mennonite farmland. It is also the Mundo Maya, the center of the Maya World. Every now and again, when life feels hectic or I fear I’m getting into a rut, I think of little Punta Gorda, Belize. It’s become one of my favorite places to dream of visiting again. Right down near the southern tip of Belize, Punta Gorda looks out on the blue Caribbean. The barrier reef and its wealth of marine life—one of Belize’s main claims to fame—is 30 miles offshore here. International Living editors Dan Prescher and Suzan Haskins recently found this little gem of a restaurant on Ambergris Caye in Belize. Ambergris Caye is Belize's most popular island and the restaurant is located south of San Pedro Town.